On behalf of Whosoever Metropolitan Community Church of Philadelphia (WMCCP), my husband Dave and I thank you for visiting WMCCP’s website. 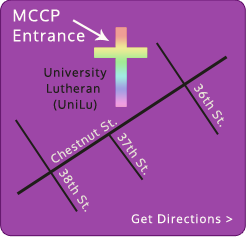 WMCCP is a Christian church with a primary ministry to the Lesbian, Gay, Bisexual, Transgender and Queer Community that strives to be a place of comfort, hope, and safety to all people regardless of background or spiritual journey. We are a revolutionary church with transformational worship and relevant ministries. If you are searching for a church home, a spiritual community, or just need a place to be yourself, we invite you to join us for worship any Sunday at 11 am. Please feel free to contact us with any questions or comments. WMCCP is here to serve you and to provide hope, healing, and restoration to the LGBTQ community in Philadelphia. We hope to see you next Sunday. We're real easy to find... just follow the signs from the front of UniLu to find us!